Sometimes you just end up where you need to be, which is what happened to me tonight. It is the time of Matariki here in New Zealand, and as a result there are special events happening all over. (Matariki is the Maori name for the Pleiades. Marariki means “eyes of God” and when the cluster of stars twinkle low in the sky before dawn it is the time of Matariki, or the Maori New Year. If you want to know more about this fascinating celebration, I encourage you to check out more here) Ambitiously, I had placed a ton of events on my calendar of things I wanted to see, do and experience during this special time, but I did not factor in the fact that I was going to be firmly in final project compilation and writing mode during this time. Today was one of those days. I have my final project presentation for Fulbright New Zealand tomorrow afternoon, and was in quite the writing flow when my alarm went off reminding me that I wanted to go to the Star Weave Jam organized by the Maori Women’s Refuge. This event is a part of the One Million Stars to End Violence Project, which aims to weave one million stars by July 2017 to be used in an installation at the Gold Coast 2018 Commonwealth Games. I thought it sounded like a cool event, and weaving the stars would be a nice creative outlet. However, when my alarm went off, I questioned it. I was in a writing flow, and was warm and cozy inside – and the Wellington wind was whipping away – not exactly an invitation to venture outside. But there was something – a nudge, if you will – to go – so I laced up my shoes, grabbed my jacket and gloves, and set out on the nice quick stroll from my apartment to the Wellington Museum where the event was going to be held. I settled in, watch the “how to make a star” video, and got some help from the volunteers, then made stars and chatted with the ladies that happened to be at my table – we had a positively delightful time – and even were treated to some fantastic storytelling by Tīramarama, a Maori storytelling duo. It was just a lovely way to spend the evening. One of my table mates, Sonia, and I particularly hit it off – we talked as we worked: about our travels, my Fulbright project and experience, my adjustment to New Zealand, her family and children, her new job and relocation to Wellington – really just a little bit of everything. She shared with me some stories from her Iwi (Maori Tribe) and Matariki. Before we knew it, it was time for the Museum to close, and we walked out together. As we were about to depart, she said “wait – I have something I want to give you”, and she placed a hard round stone in my hand. As she gave it to me she explained that it was an Aroha stone (Aroha means unconditional love in Maori). 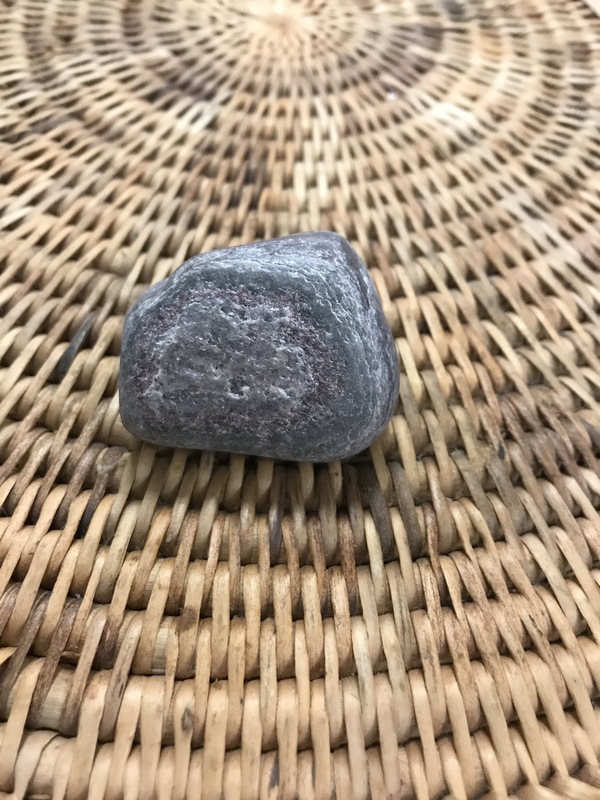 She shared with me that the Aroha stone is sacred to the Maori people (as are many stones) and that it is a special stone because it turns the energy around it into love, which is transmitted through the person it is gifted to. It is one of the few sacred stones that does not require special cleansing, because it is a cleansing stone on its own. She shared that she had been carrying it around for a few days – trying to figure out who to give it to, and that she was certain that the stone was seeking its home with me. It was a special and very touching moment. We hugged one another goodbye, with plans to hopefully see each other at events this week, and I strolled home, the stone in my pocket. When I got home I got the opportunity to look at the stone – what a gorgeous, colorful piece it is (and this picture doesn’t really do it justice). The pink and white colors are just striking. What a nice reminder to stop, be present, and savor the opportunity I have been given to be here in this amazing country, surrounded by lovely people and a beautiful culture, even as my time here is rapidly coming to a close. Previous Previous post: Lake Tekapo – It is all about the Sky!